The term eugenics was coined in 1865 by Francis Galton, Charles Darwin’s cousin. A m ember of a wealthy and successful family, Galton noticed that men of high social ranking were often related to one another. 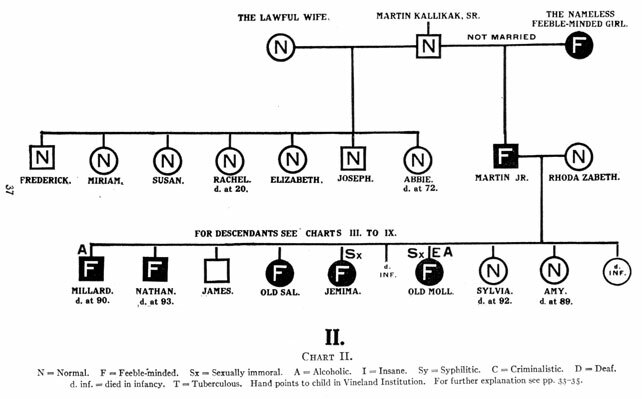 Galton devised the science of statistics to study these men’s families, producing what he called pedigree studies . He used this research to argue that biology, rather than wealth or social privilege, caused these men’s success. He believed humanity could be improved through two processes – positive eugenics and negative eugenics. In 1900, Galton’s ideas were given some support when scientists rediscovered the work of agriculturalist and monk Gregor Mendel . In the 1820’s, Mendel had used selective breeding with peas to produce tall, short, green or yellow plants. Eugenicists argued that selective breeding could also produce positive outcomes amongst humans. However, they seriously overestimated the effects of genes on most human qualities. Further, they ignored the effects of poverty, discrimination, and lack of opportunity. Galton’s studies met with enthusiasm from many scientists and liberal reformers during the early 20th century. There was fear of race degeneration, based on the belief that people of ‘good stock’ were not replacing themselves while people of ‘tainted stock’ were over-breeding . In North America, racism and concerns over non-English immigration added fuel to the fire . Eugenic reformers embraced the simple promises that eugenics seemed to offer for reducing poverty and the ills of modernity. In 1912, American psychologist Henry Goddard, who promoted the use of the Stanford-Binet IQ test to test for ‘mental defects’, published a very popular book on the Kallikak family, arguing that feeble-mindedness could be passed on from generation to generation . Goddard’s book used poorly-researched pedigree charts and doctored photographs to ‘prove’ his findings. His claims were believed and were used to support eugenic ideas and legislation. Many states in America, three provinces in Canada, and several countries (including Sweden) established laws to identify and prevent unwanted breeding, while passive eugenics, in the form of institutionalization and sequestering of ‘undesirables’ occurred much more broadly. During WWII, Adolf Hitler and the National Socialist party in Germany implemented the most famous and terrible example of eugenics. This began with Aktion T4, which used disabled people as the model for later Nazi eugenic programs . After the discovery of Nazi extermination camps, sterilization programs, and medical experimentation, the Nuremburg Trials made it clear that such misuse of science was no longer acceptable. Even so, many states with eugenic laws, including Alberta, quietly continued their programs for decades after WWII. Gould, S.J., The Mismeasure of Man. 1996, New York and London: W. W. Norton & Company. Kevles, D.J., In the Name of Eugenics: Genetics and the Uses of Human Heredity. 3rd Printing ed. 1995, Cambridge, Massachusetts: Harvard University Press. Mitchell, D. and S. Snyder, The Eugenic Atlantic: Race, Disability, and the Making of an International Eugenic Science, 1800-1945. Disability & Society, 2003. 18(7): p. 843-864. Lifton, R.J., The Nazi Doctors: Medical Killing and the Psychology of Genocide. 1986, London: MacMillan Publishing. 95-97.